This article is about the pitcher. For the spymaster, see William J. Donovan. For other uses, see William Donovan (disambiguation). William Edward Donovan (October 13, 1876 – December 9, 1923), nicknamed Wild Bill, was an American right-handed pitcher and manager in Major League Baseball. He played eighteen seasons with the Washington Senators (1898), Brooklyn Superbas (1899–1902), Detroit Tigers (1903–12; 1918), and New York Yankees (1915–16). Born in Lawrence, Massachusetts, Donovan won his "Wild Bill" nickname while playing for Hartford in the minors. 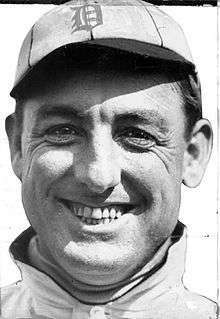 When Hartford teammate Cy Seymour was returned to the Major Leagues after throwing wildly over a fence behind home plate, Donovan walked nine consecutive batters. Donovan received a $10 fine and a new nickname. Donovan served as the head football coach at Georgetown University in 1898, leading the Hoyas to a record of 7–3. Donovan made his major league debut on April 22, 1898. During his first three seasons, he was a seldom used reliever on Superbas teams that won consecutive National League pennants, in 1899 and 1900. With the departure of pitchers Joe McGinnity and Gus Weyhing from the team after the 1900 season, Donovan became a starting pitcher of 38 games, posting a 25–15 won–loss record with a 2.77 earned run average (ERA) in 351 innings. Donovan moved to the American League's Detroit Tigers in 1903, where he would continue his pitching success alongside teammates George Mullin, Sam Crawford, and later Ty Cobb. In the 1907 season, the team won the American League pennant behind Donovan's league-leading winning percentage of .862, in which he went 25–4, a mark that remains the highest single-season winning percentage in Tigers history. Appearing in three World Series (1907–09), he went 1–4 with a 2.88 ERA. Donovan also became the first pitcher to lose consecutive deciding games in the World Series in 1908–09. On May 7, 1906, Donovan accomplished a rare feat even for the best base stealers. He stole second base, third, and on the front end of a double steal, took home in the fifth inning of an 8–3 victory over Cleveland. He also hit a triple in the same game. An arm injury ended Donovan's career in 1912. Donovan was player–manager for the Yankees from 1915 to 1917 and a coach for the Tigers in 1918. 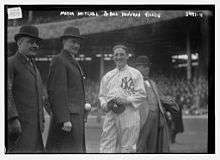 He made several spot appearances for the Yankees and Tigers, including one final start on the last day of the 1918 season, which he won. He later served as manager of the Philadelphia Phillies for part of the 1921 season, being replaced after 44 games by Kaiser Wilhelm. Donovan was accused of having some knowledge of the attempt to throw the 1919 World Series but was vindicated by commissioner Kenesaw Mountain Landis and received an apology from his accuser, William Baker, president of the Philadelphia Phillies. In December 1923, while traveling on the 20th Century Limited train to Chicago for Major League meetings, Donovan, the New Haven manager, died when the train wrecked in Forsyth, New York. New Haven president George Weiss had swapped berths with Donovan and escaped with a minor injury. Phillies owner William F. Baker (the man who accused him of wrongdoing in the Black Sox scandal) was also on the train, but he was unhurt. In 378 career games, Donovan had a 186–139 won–loss total and threw 2964⅔ innings with 289 complete games and a 2.69 ERA. ↑ "Georgetown Football: Head Coaches". HoyaSaxa.com. Retrieved November 28, 2014. Wikimedia Commons has media related to Bill Donovan.